Winners in 2016 in the Czech Republic and one year later in New Delhi, the combination formed by Sweden’s Matilda Ekholm and Hungary’s Georgina Pota emerged the biggest casualty in the opening round of the Women’s Doubles event at the Seamaster 2018 ITTF World Tour Asarel Bulgaria Open in Panagyurishte. The no.4 seeds, on the morning of Thursday 16th August, they were beaten in four games by Germany’s Nina Mittelham and Sabine Winter (13-11, 11-7, 7-11, 11-9). Defeat for Matilda Ekholm and Georgina Pota, contrary to expectations, it was the same for the partnership formed by Slovakia’s Barbora Balazova and the Czech Republic’s Hana Matelova. 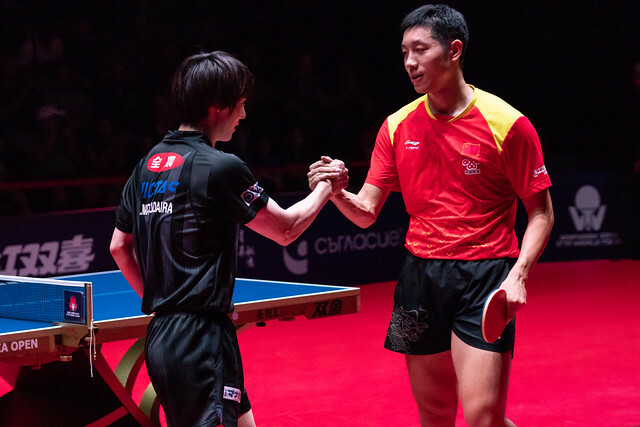 Occupying the no.5 seeded spot, the runners up earlier this year at the ITTF Challenge Series tournament in Poland, they experienced defeat at the hands of China’s Liu Gaoyuan and Zhang Rui (6-11, 11-6, 8-11, 11-6, 11-6). Success for China and there was more success but as anticipated; Chen Ke and Wang Yidi, the no.7 seeds, overcame the formation of the Czech Republic’s Dana Cechova and Britt Eerland of the Netherlands (11-3, 11-4, 11-5). Notable performances from Chinese pairs, it was the same from Japan. In fact, the efforts of the players from the Land of the Rising Sun, was even more prominent. Honoka Hashimoto and Hitomi Sato, the top seeds, beat Korea Republic’s Lee Yujin and Park Joohyun (11-7, 11-8, 11-4); Kasumi Ishikawa and Mima Ito, the no.3 seeds and defending champions, accounted for Romania’s Elizabeta Samara and Bernadette Szocs. Meanwhile, Hina Hayata and Miu Hirano, the no.2 seeds, received a walk-over when due to face Poland’s Natalia Bajor and Magdalena Sikorska, as did the latter’s colleagues Katarzyna Grzybowska-Franc and Natalia Partyka, the no.6 seeds, when scheduled to meet Russia’s Valeria Shcherbatykh and Mariia Tailakova. Progress to the quarter-finals for visitors to Panagyurishte; there was also opening round Women’s Doubles success for the host nation. Kalina Hristova and Ivet Ilieva beat the combination formed by Chinese Taipei’s Lin Chia-Hsuan and Belgium’s Lisa Lung (3-11, 11-7, 11-6, 11-6). At the quarter-final stage Honoka Hashimoto and Hitomi Sato meet Katarzyna Grzybowska-Franc and Natalia Partyka; Liu Gaoyuan and Zhang Rui oppose Nina Mittelham and Sabine Winter. In the opposite half of the draw, Kasumi Ishikawa and Mima Ito confront Chen Ke and Wang Yidi; Hina Hayata and Miu Hirano face Kalina Hristova and Ivet Ilieva. The quarter and semi-final matches in the Women’s Doubles event will be played on Friday 17th August.